Fairlane frontal styling for 1958 bore a familial resemblance to that year's new Thunderbird, while ovoid taillight pairings distinguished the big Fords at the rear. Swathes of gold anodized body-side trim marked the flagship Fairlane 500s. 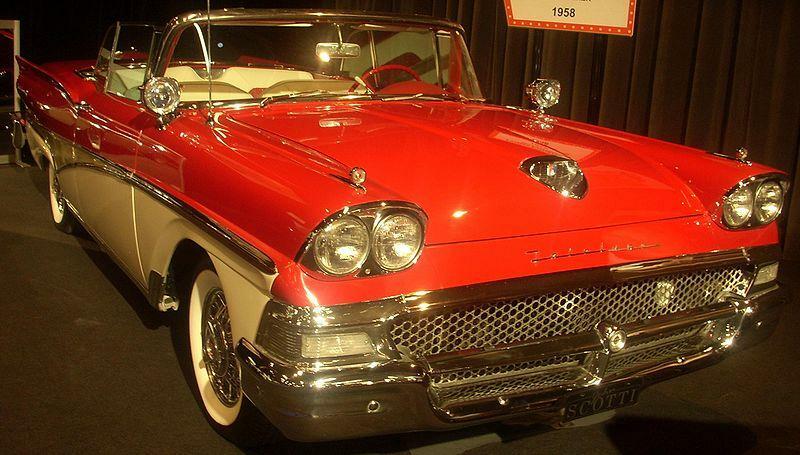 A new 300-hp, 352-cid Thunderbird Special V8 option became available in premium models during 1958. The Fairlane and Fairlane 500 rolled into 1959 with more conservative styling and new rooflines featuring reshaped wrap-around rear windows on sedans. Soon after 1959 production started, though, Fairlane 500 closed models were demoted to mid-level status, as new Galaxie styles, with Thunderbird-inspired rooflines, arrived. At the same time, a simple badging change converted 1959. Ford Sunliner convertible and Skyliner retractable hardtops to Galaxie models. As in 1958, all full-size '59 Fords except the Skyliner were offered with Ford's standard 223-cid six-cylinder engine. “Thunderbird” V8s of up to 352-cid were again available. Excepting the occasional Skyliner, the distinctive but rust-prone 1958 Fairlanes are uncommon today. The '59s have seemingly fared better. A nicely turned-out 1958-59 Fairlane 500 is sure to attract admirers at any Ford gathering.